Charmant Som is well named - it is a hill with a charming summit. It doesn't have a spectacular profile like the Grand Som or Chamechaude, and it doesn't have the dominating cliffs of Dent de Crolles or Mont Granier, but it does have its own charms. 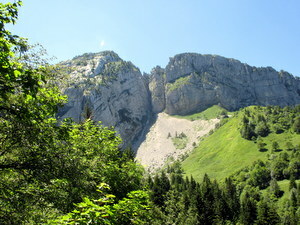 Being located on the west side of the col de Porte, it is somewhat overwhelmed by Chamechaude, and doesn't really stand out as a mountain in its own right. To add insult, a road ascends from the col de Porte to within a few hundred metres of the summit. This is, of course, no reason to dismiss it as unworthy, but it is an excellent reason to avoid it at weekends and on bank holidays! Looking at the map, you can readily see that Charmant Som is quite an imposing massif, which covers a large area, and boasts some impressive cliffs below the north of the summit, and three long ridges. It also presents an interesting eastern flank towards la Martinière, with steeply dipping slopes of bare limestone. All in all, a hill worth exploring. Two routes are described which ascend the hill, both of which require a full day, together with one that ascends La Pinéa, a superb vantage point on the southern ridge.